Whether you’re launching a new company or planning a re-launch, developing a brand that reflects your business is one of the most fundamental steps. Though it might seem simple enough, often not enough thought or planning is given to the process. More than just your company name and logo, your brand IS your business and everything it stands for; it’s what makes you different from your competitors and keeps your customers loyal to your organisation. You can achieve branding through loads of different mediums. Perhaps the most obvious is your company’s visual identity – think logo, colours, website design and product packaging. Consistency in the visual department enables customers to immediately recognise your brand, which in turn helps them become familiar with your products and what you do. Next up is your tone of voice, which will be imperative for successful advertising campaigns and company communications. The way you come across to your audience (and we’re talking both in-store and online here), is a crucial element to your brand, as an inconsistent tone can lead to mistrust from your potential customers. Keeping it consistent again brings that recognisable quality to your brand – your customers know what to expect and, as a result, this helps to build that all-important trust. The key is to imagine that your brand is a person, with its own personality, dress-sense, values, characteristics and communication style. Every person you meet has their own individual story to tell, and your brand should be no different. All of these factors make up what your brand is, what it stands for and how it relates to your target audience. It’s all very well creating and defining your brand, but how do you maintain that brand and make sure it remains an ever-present component in your overall business approach? Simple. You just need a strong set of brand guidelines. The history of your brand. Your brand vision, key values, message and mission statement. Your logo and how to use it (we’re talking where it should be used in official documentation and presentations, the correct sizes to use, any variations and a list of dos and don’ts). Your brand colours – these should be displayed in a palette and show your primary and secondary colours, as well as colour breakdowns for print and web. Fonts and type style – your brand should have a specific font or font family, and guidelines should include the correct sizes to use for different purposes, for example in company literature. Image and photography style – include both styles that work for your brand and styles that don’t. Business card / letterhead / brochure designs and layouts. Before we move on, a note on presentation. Make sure your brand guidelines are defined in a professional way and put plenty of thought into them. The importance of your brand will be reflected in how you present your brand guidelines. 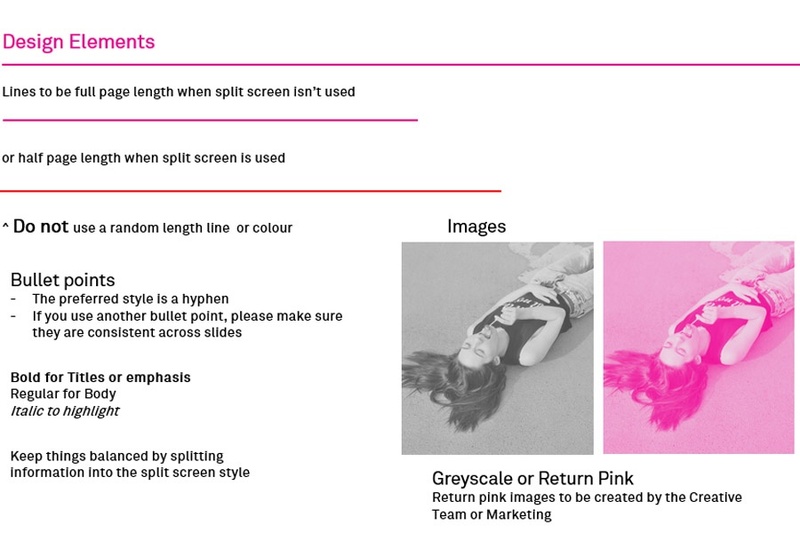 For example, let’s compare the idea of a report-style list of ‘dos and don’ts’ in an MS Word document to a well thought out, perfectly designed ‘Brand Guidelines Pack’. We know which one we’d take more seriously. The key takeaway here is that the way your brand guidelines pack looks and reads should reflect how important it is to your brand. This reinforces the idea that you must always refer to the guidelines, and that it is a serious document rather than a throwaway second thought. Once you’ve put your brand guidelines together, it’s important to make sure they don’t slip out of view as your business grows. In today’s climate, it’s easy to get swept away on the tide of business growth and sometimes brand guidelines can get diluted in the excitement of growing your team or hiring external providers. But how to stop this from happening? Don’t worry, we’ve put together a few pointers to make sure your brand always stays at the forefront of your company’s priority list. The world is an ever-changing place. New trends present themselves to us all the time, and if you’re even the tiniest bit savvy when it comes to your industry’s climate, you’re probably always on the lookout for ways to grow and develop your business. While growth for your business is a positive step, it’s important to keep in mind that your branding needs to grow and progress with you. This is especially true when it comes to tone of voice – you might want to keep in line with the latest slang, or reinforce that even though a certain word or phrase is trending at the moment, it is never to be used in your activity. For example, the word ‘bae’ was a firm favourite among a number of fashion brands in 2016-17, but other retailers refused to jump on the bandwagon because they wanted to differentiate from ‘trending’ phrases and stick to their own message. Whichever you do is entirely up to you. If you want to incorporate a trending word into your branding, it might be worth considering whether you’d be open to keeping it there once its popularity has ebbed. The best way to ensure your brand continues to stand out is to trial new things that might differ from your original brand guidelines. That might seem counter-productive, but think about it this way: if we consistently repeated everything, nothing would ever move forward. Encourage your teams to trial new branding ideas every now and then, or source examples of new graphics and strong brand campaigns from competitors that could inspire the growth of your current guidelines. You could do this by holding a brand guidelines review brainstorm, or whatever suits your company’s way of working. Basically, don’t shut yourself off from new ideas with the THIS IS HOW WE DO THINGS AND ONLY THIS WAY mentality, but equally don’t go too far the other way either. There should always be certain limitations and rules that remain consistent, such as your logo uses and disfiguration. Finally, make sure your brand guidelines truly represent what your brand activity looks and sounds like. If it doesn’t, you’ll have a whole lot of confusion going on internally, and everyone will just start doing what they think is right, rather than referring to a solid set of guidelines. 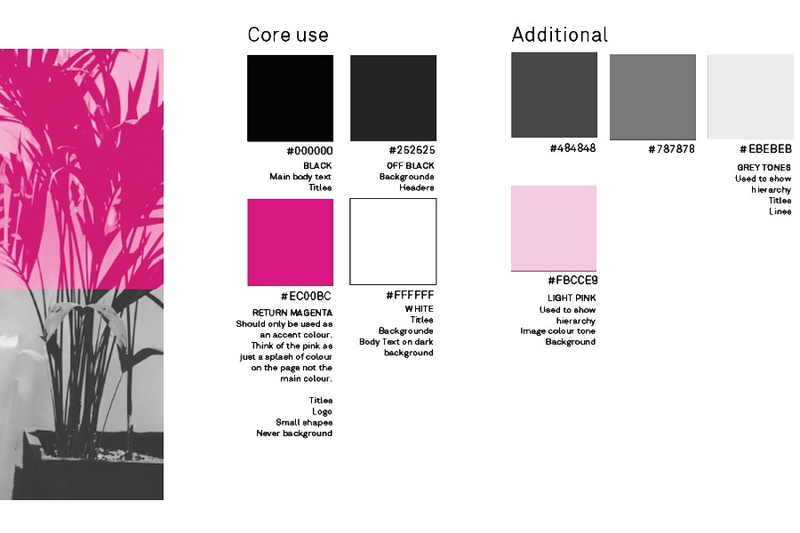 Need help keeping consistent with your brand guidelines? Struggle to find the time to keep your overall digital strategy in line with your brand guidelines? Don’t worry, that’s what we’re here for! Whether it’s copy and imagery for your paid search and social campaigns or on-brand content for your site, we’ve got a service to help you. Get in touch today to learn more.